Tasting menus are built to be a progression, so, for instance a dinner tasting menu would begin with lighter courses (fish or a soup) and then move to heavier courses (meat or pasta). This is also true with dessert tastings, starting with something fresh, and refreshing, and ending with heavier, richer desserts. Therefore, when designing this first dessert my chef began with the idea that he needed a new, refreshing, palate-cleansing dessert to be the opening to one of his tasting menus. A palate cleanser is generally served between the entree and dessert to remove lingering flavors from the mouth so that the dessert may be enjoyed unhindered by garlic, onions or other pervasive spices. It can be a sorbet, a light beverage, or a small bite that has cleansing properties. The most famous French palate cleanser is a shot of Calvados (an apple brandy), called le trou Normand in French. It was with this Calvados in mind that my chef started designing this first dessert. Being a liquid Calvados limits in some ways how it can be used in a dish. My chef began by pairing it with apple. This seems almost counter-intuitive because apple flavor already is in Calvados, but it actually works well because the fresh apple reinforces the apple-y-ness of the Calvados and it begins to bring this dish in a refreshing direction. Although Calvados is an excellent palette cleanser, it is not very refreshing. So, what is refreshing? The first thing that I think of is toothpaste. Toothpaste is a great example of a product that makes your mouth feel cleaner (even without the brushing action). So mentholated things are refreshing as are acidic things, spicy flavors, fermented products like yogurt, and, not quite as pronouncedly, bitterness, saltiness, and alcohols. The next flavors my chef chose to add were from the anise family: Green anise which is a seed similar to fennel but with stronger notes of licorice and fresh celery which actually has quite a bit of natural licorice flavor. Then for that toothpaste “ah” feeling he utilized a Spanish cough drop. The brand they prefer is called Fisherman’s much like we like Ricola. I like the Fisherman’s flavor, it is very herbaceous and minty. This flavor he paired with some apple cider vinegar, which is fermented but once again reinforces the original apple. At this point we have Calvados, apple, green licorice, and minty flavors; the problem with this dish then is that all of these flavors are clean and water based, they would make a very good smoothie. There is no fat or creaminess, things that are frequently associated with dessert. The problem with most fat or creamy elements is that they are not refreshing and can in fact be heavy on the palate. Therefore, as a last flavor component my chef added kefir – a fermented milk drink – which is refreshing because of the fermentation flavor. So, now that we have all of our flavors let’s put them together with techniques. Please, note that with all of his desserts, my chef layers the flavors in each component so that few components are only one flavor and few flavors are in only one place on the dish. So from bottom to top: There is a thin layer of kefir on the bottom which has been thickened to the consistency of cream cheese. 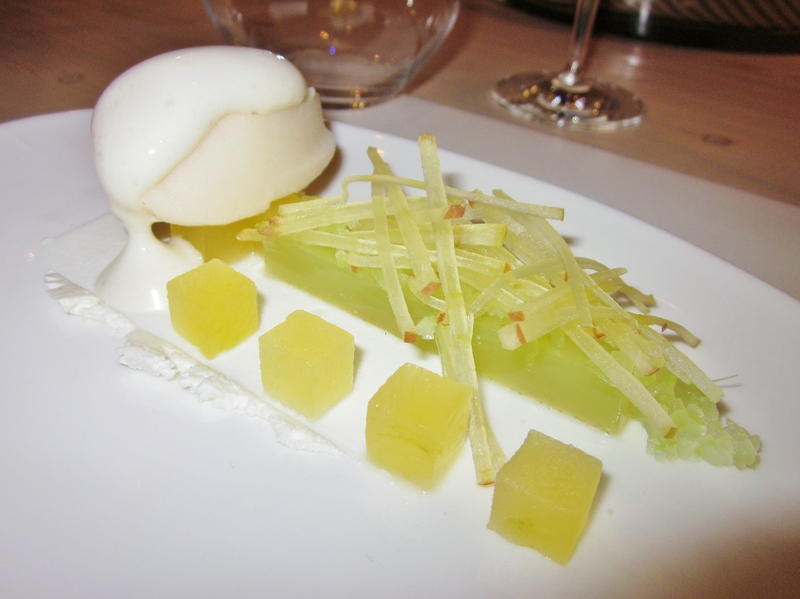 The cubes are apple that have had Calvados forced into them. There are three on the left holding up the sorbet and then four more in the front. 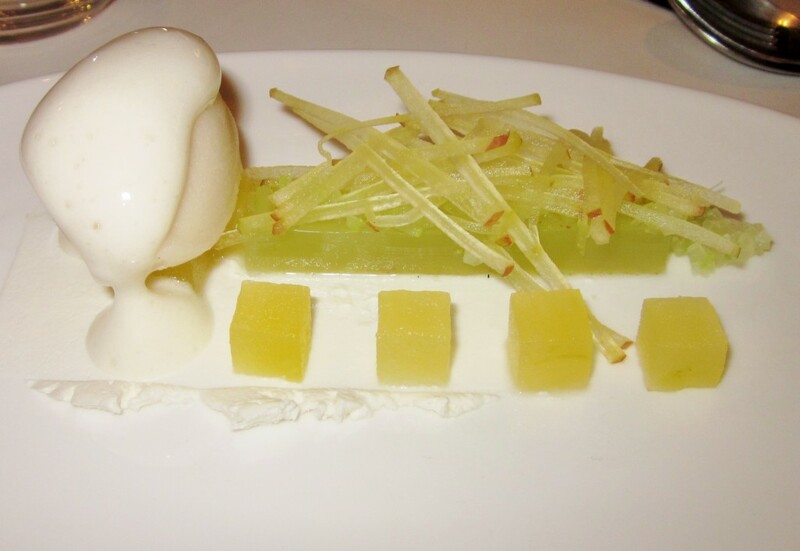 The sorbet is apple juice, Calvados and apple cider vinegar which is topped with a vinegar and Fishermans foam. To the right is a long rectangle of gelee flavored with juiced celery and green anise topped with small diced celery that has been scalded in sugar syrup to keep it from turning color and to give it some sweetness. (These are hard to see in the photo.) This is topped with long matchsticks of apple that have been flavored with the Fisherman liquid. When describing this dish later to a friend, the only word that popped to mind was: Clean. The dish accomplished everything that it set out to do: it was a palate cleanser; it was a nice start to a menu, it wasn’t heavy or overwhelming but at the same time, while it tasted good, it didn’t really do anything for me. I liked it but I wouldn’t eat it again without a reason. Intellectually, I know that a dessert tasting menu needs dishes like this: clean, refreshing, with lots of different textures but somehow this one didn’t knock my socks off. There wasn’t enough of the kefir, celery is a strange flavor in desserts, and I didn’t feel like it was integrated enough to make it work for me. I also just wanted a little more content; there were a lot of components that sort of slid away in my mouth without requiring chewing or thought as to how the flavors were working together. However, I loved the licorice and vinegar foam. I actually didn’t expect to like it because it seems like a strange combination but it really worked: it was refreshing and bright and harmonious. Overall, this is a good starter course and I did enjoy it.